Focused on mapping out contemporary and future domains in philosophy of technology, this volume serves as an excellent, forward-looking resource in the field and in cognate areas of study. The 32 chapters, all of them appearing in print here for the first time, were written by both established scholars and fresh voices. They cover topics ranging from data discrimination and engineering design, to art and technology, space junk, and beyond. 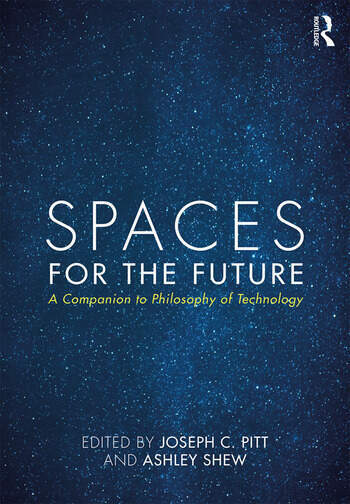 Spaces for the Future: A Companion to Philosophy of Technology is structured in six parts: (1) Ethical Space and Experience; (2) Political Space and Agency; (3) Virtual Space and Property; (4) Personal Space and Design; (5) Inner Space and Environment; and (6) Outer Space and Imagination. The organization maps out current and emerging spaces of activity in the field and anticipates the big issues that we soon will face. Anna Lauren Hoffmann, "Data, Technology, and Gender"
Monique Wonderly, "Video Games and Ethics"
Yoni van den Eede and Katleen Gabriels, "Social Networking"
Jessie Mann, "The Philosophy of Art and Technology"
Shannon Vallor, "Robots with Guns"
Andrew Wells Garnar, "Educational Technology"
Andrew Feenberg, "Agency and Citizenship in a Technological Society"
Ashley Shew, "Animals in Philosophy of Technology"
Evan Selinger and Woodrow Hartzog, "Obscurity and Privacy"
Gordon Hull, "Copyright between Economic and Cultural Models of Creativity"
Craig Condella and Julie Swierzcek, "The Cloud"
Deborah Johnson, "Ethical Issues in Big Data"
Johnny Hartz Søraker, "Virtual Environments"
Robert Rosenberger, "The Organization of User Experience"
Albrecht Fritzsche, "Dancing the Device: a translational approach to technology"
Dana Belu, "On Harnessing Birth in a Technical Age"
Robert Darrow, "Is Renewable Energy Technology Revolutionary?" Tina Sikka, "Geoengineering and Climate Change"
Robert-Jan Geerts, "Climate Change and Philosophy of Technology"
Rosalyn Berne, "Space Tourism and Science Fiction"
Zachary Pirtle and David Tomblin, "Well Ordered Engineering: Participatory Technology Assessment at NASA"
Diana Hoyt, "When Loving Your Planet Isn’t Enough"
Joseph C. Pitt, "Transcendence in Space"
Nicholas Rescher, "The Role of Technology in Natural Science"
Joseph C. Pitt, a Fellow of AAAS, has been teaching at Virginia Tech for 45 years. His major area of scholarship is philosophy of technology with an emphasis on the impact of technological innovation on scientific change. He is the author of 4 books and the editor/co-editor of twelve others. He is past president of the Society for Philosophy and Technology and served as Editor-in-Chief of Techne: Research in Philosophy and Technology, of which he is currently on the editorial board. Ashley Shew works in philosophy of technology on topics relating to emerging technologies, animals, disability, and environment. Her first book, Animal Constructions and Technological Knowledge, will be published next year. Her latest work concerns how disabled bodies are used in technological imagination and how narratives about technology often fail to match up to the lived experience of disability. She collects class materials and information about disability and technology on her website, http://techanddisability.com.